Though Stanford is famous for its curving arches and the red-tiled roofs of its Mission Revival-style architecture, the campus hosts other architectural gems representing a split between old and new. Among those gems is the Hanna House, designed by world-renowned architect Frank Lloyd Wright. Last spring, Erik Johnson M.A. ’12 Ph.D. ’16 taught a Program in Writing and Rhetoric course titled The Rhetoric of What Counts as Art. As part of the course, Johnson brought his students to tour the house, which sits tucked away just past the Upper Row, its existence little known to students. “Frankly, if people don’t take advantage of and appreciate things like [Hanna House] then they disappear,” he said. Few students, however, do seem to take advantage. Chris Carlton, a Cantor Arts Center docent who leads tours at the house on the weekends, estimates that around only eight students a month tour the house. The Hanna House was built to bring to life the dream of childhood education specialists Jean and Paul Hanna. Both grew up as the children of itinerant pastors, with childhoods spent moving from rental house to rental house. After meeting and falling in love, they decided they wanted to build and own their own home. With Wright as their architect, however, the end result was anything but ordinary. The Hanna House has exactly two right angles; the rest are 120 degrees. The entire house is built on a grid of hexagons, prompting an alternate name of “the honeycomb house.” In keeping with Wright’s theory of organic architecture, the house isn’t built on top of the hill but built to blend in with it and the rest of the environment. A cypress and an oak tree, for example, were present before the designing of the house but were not removed during construction. Instead Wright designed the house to be built around the trees as if they themselves were a part of the home. “Wright is great at controlling the environment in a way that manages your experience but not in a manipulative way because you’re always mindful and aware of it,” Johnson said. According to Carlton, the fact that Wright was one of the most famous architects at the time didn’t really register with the Hannas. By contrast, they had simply read a paper about his philosophy of organic architecture and promptly proceeded to write him a fan letter. While Wright eventually agreed to design the house, when the family eventually moved into the residence in 1938 — a year after construction began — work wasn’t quite done. Instead, Wright had created the house to constantly adapt to the family’s changing needs over the years. “The whole concept, the thought process behind it in terms of thinking about it as a honeycomb and how strong the honeycomb is for the bee colony and the application to the family — I thought that was really unique in terms of the flexibility that he was trying to build into a structure,” Carlton said. A guesthouse was eventually added and when the three children moved out, walls were taken down to expand the living and work spaces for Jean and Paul. Wright’s influence extends far beyond Hanna House, of course. Named in 1991 as the greatest American architect of all time by the American Institute of Architects, his other creations include the Guggenheim Museum in New York City, the Johnson Wax Headquarters in Racine, Wis., and the Imperial Hotel in Tokyo. 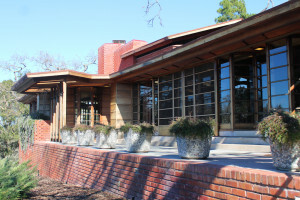 A couple in attendance at a Feb. 9 tour of Hanna House said they lived in a house heavily influenced by Wright’s works. Today the Hanna House exists more as a museum than a place of residence. The Hanna House Board of Governors made this decision after the 1989 Loma Prieta earthquake damaged the house extensively. John Hanna ’54 J.D. ’59, a son of Jean and Paul and a member of the Board of Governors, recalled an enjoyable childhood growing up in the house. “We knew it was special because there were always curiosity seekers and photographers coming to the house all hours of the day with their cameras poised, peeking into the windows and taking pictures,” Hanna said. The Hannas donated the house to Stanford in 1975 and it served over the years as the home for four provosts. Now a graduate student is assigned as caretaker and lives in the guesthouse.